Even if you've never been to Baton Rouge, Louisiana, you might now be familiar with Airline Highway. On Sunday, three Baton Rouge police officers were killed and several were injured in a shooting that occurred near the busy road. If you've been following current events, Sunday's officer shooting probably wasn't the first time you'd heard of Airline Highway in Baton Rouge. Before 9 a.m. local time on Sunday, officers responded to a call near a convenience store at the intersection of Airline Highway and Old Hammond Highway. During the response, as many as three suspects opened fire on the officers. When it was all said and done, officials confirmed that the incident had left three officers dead and three others in the hospital. The location of Sunday's incident is noteworthy, particularly in light of other recent events in the area. The convenience store near where officers responded on Sunday is just about a mile up the road from the Baton Rouge police headquarters. It's also about five miles away from the convenience store where police shot and killed 37-year-old Alton Sterling earlier in the month. On Sunday afternoon, it was unclear if the events were connected in any way, but the locations seem like an eerie coincidence, at the very least. Airline Highway is a long, main road that stretches through Baton Rouge and connects the city to other parts of Louisiana, including New Orleans. As such, it's maybe not a huge surprise that many of Baton Rouge's recent events have been described in relation to the highway. Still, it's a road that spans an entire city, and both of the city's recent high-profile shootings have occurred within a matter of miles — and near the police headquarters. In addition to the shootings, Airline Highway has been the site of many of the city's recent protests, which have occurred in response to the shooting of Sterling and similar shootings elsewhere in the country. At one point, protesters attempted to block traffic on portions of Airline Highway and connecting interstates. DeRay McKesson, a well-known leader of the Black Lives Matter movement, was arrested during the city's wave of protests. McKesson was taken into custody as he was walking along Airline Highway. 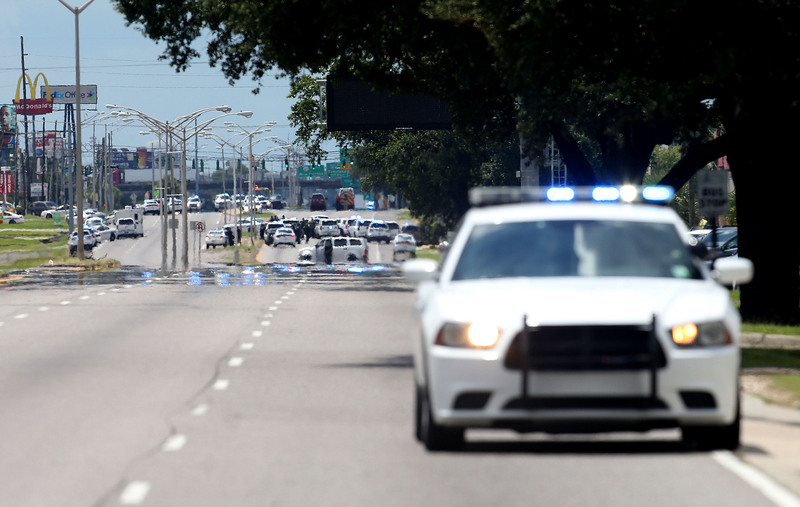 Already a major thoroughfare in Baton Rouge, Airline Highway has quickly become an epicenter of the increasingly high tensions between police and their communities. Even if Sunday's attack had no connection to the Sterling shooting or other similar incidents, the shooting remains relevant as an instance of gun violence against police. Ultimately, that relevance is only in part because of the geographic location.